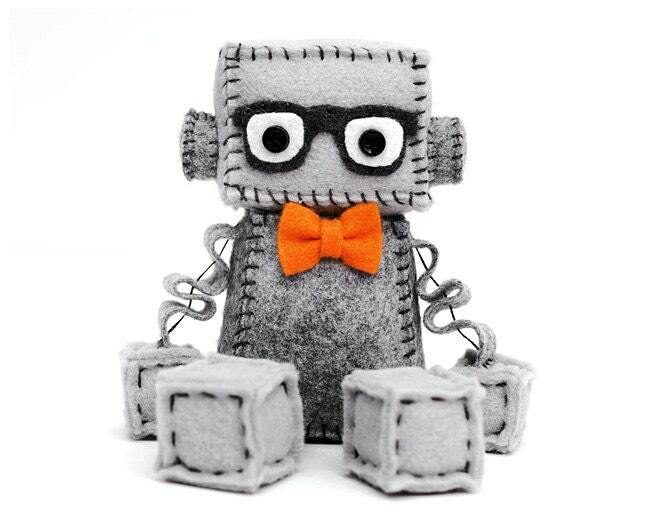 Geeky plush robot looks extra cute in his nerdy glasses and bow tie (in your choice of color). He is fluent in binary. His favorite word is "anthropomorphic". He is definitely a hipster robot. Geek Plush Robot is about 4 inches tall sitting. It is made of premium wool felt, cotton embroidery floss and little plastic buttons for eyes. Husband loved his birthday present! I got him a robot that looks like him. It sits on his work desk now. Thank you! Fast delivery + nerdy robot = happy birthday boy.